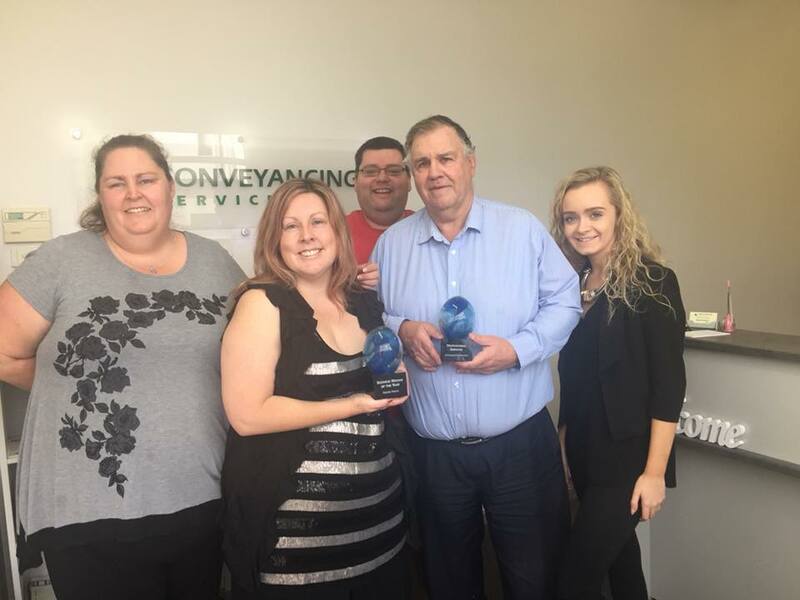 Conveyancing Services have won three top awards in the last two months, one for each business partner and one for the company itself. Natalie Mason was awarded ‘Business Woman of the Year’ at the Hunter Region Business Hub Awards in September, and Conveyancing Services were the winners of the ‘Professional Services Award’. Tony Morris then won the ‘President’s Award for best practice and professionalism’ at the Australian Institute of Conveyancers – NSW Division annual awards night in Sydney at the start of October. Tony has long been held in high regard within the Conveyancing profession and his win was acknowledgement of his exemplary career. “We’re so excited to win these awards and so honoured that all our hard work has been recognised. We are really proud of our staff for their dedication and want to thank all of our wonderful clients” says co-owner Natalie Mason. Natalie and Tony are co-owners of Conveyancing Services. Both business partners worked at the company before purchasing the business five years ago. They are both proud and humbled of how far Conveyancing Services has come. Tony Morris has been part of Conveyancing Services since it opened in 1986. He has dedicated his professional life to making the complex issues involved in buying and selling property as simple and stress-free as possible for his clientele. Natalie Mason has been part of the business for the last 17 years. She started in the office and obtained her conveyancing licence 10 years ago. She says one of the most satisfying aspects of the job is helping first home buyers to secure their first property. Tony and Natalie are also committed to giving back to their community. To celebrate a milestone birthday for the business last year they decided to do 30 acts of kindness, incorporating staff and the local community. Conveyancing Services are also proud sponsors of the Westpac Rescue Helicopter. Both Natalie and Tony are Licensed Conveyancers, Certified Practising Conveyancers and Justices of the Peace. Conveyancing Services is a Hunter based company with offices in Adamstown and Maitland. They celebrated 30 years of business last year and offer Conveyancing, the process of transferring legal property title from one party to another, throughout New South Wales. This entry was posted in Conveyancing on October 24, 2017 by conserv. lesley conway on Why wouldn’t settlement take place on the Contract date? be taken as legal advice.